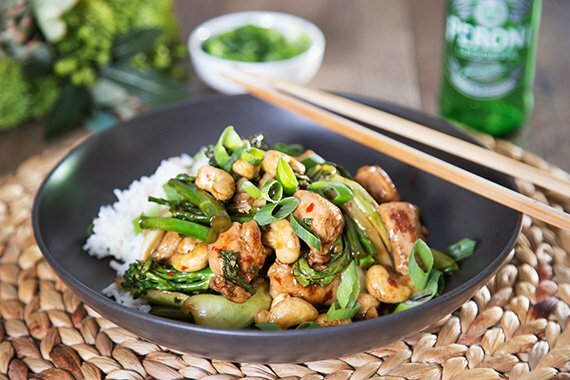 This midweek version of Cashew Chicken has the right combination of flavour and freshness. It’s salty and spicy, but without being overpowering. Need more spice? Add more sambal oelek. The crisp greens brings a fresh balance. Share your #youplateit moment with us on Instagram and enjoy! In a medium pot, bring 1&frac13; cups water to a boil. Stir in the rice; cover and reduce the heat to low. Simmer for 15 minutes until all of the water is absorbed. Taste the rice; if it is still too firm, add a few more tablespoons of water. Cover the pan and let the rice absorb the water off of the heat. Fluff the finished rice with a fork. Heat olive oil in a large high sided pan (or pot) over medium heat. When oil is shimmering add garlic and cook for 2 minutes. Add the chicken and the sambal oelek (to taste), then cook for 4 minutes. Add the broccolini, pak choy, oyster/soy sauce and white spring onion ends. Cook for 4 minutes, stirring occasionally. Sprinkle in cashews and cook a further minute. Divide chicken and rice between plates and garnish with green spring onion ends. Enjoy!